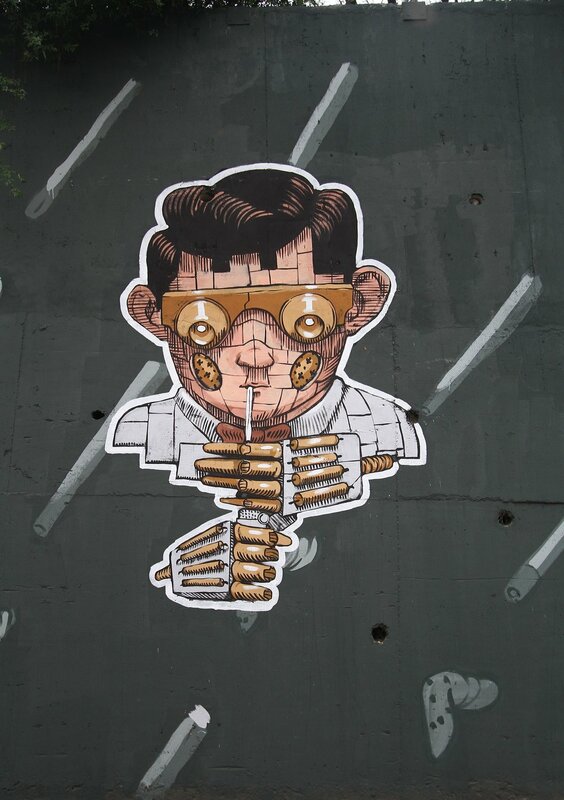 Pixel Pancho is an Italian street artist specialized in large wall murals. He constantly works with an earthy color scheme to convey a more ancient feeling, and he creates robotic creatures inspired by different environments: the beach, the forest, the Sci-Fi universe. #ArtDistilled is an amazing project by Dictador Art Masters, a foundation whose primary goal is to promote art in both traditional and radical ways. Pixelpancho Studio took part in the second session of the project, on Jan 2019. We painted some tanks into the abandoned distillery in the middle of the jungle, hidden between the rainforests of the Perijá and Sierra Nevada de Santa Marta mountain ranges, and - to that jungle - we paid tribute. Because this Graffiti Museum lies in an important ecological corridor between two endangered environments, and art can attract attention more than anything else. Invited by Points de Vue / Street Art Fest, Pixelpancho painted this massive wall in Bayonne, in the department of Pyrénées-Atlantiques. “Marinella, Pensieri Volanti” is its name. Who is Marinella? Marinella is a robot, and is a woman. She has human feelings. She is French, but she doesn’t want to renounce to her Basque part. She embodies the confusion of people leaving in border areas: their identity is uncertain, their feelings poised, their hearts divided in half. Pixelpancho painted this wall in Sacramento, the capital of California, during Wide Open Walls Art Festival. The Californian Princess is a female robot: she could remaind you the famous Princess Leila of Star Wars but, instead, she’s the representation of the artist’s disappointment. California is popular, it’s the quintessence of pop. It’s famous all over the world for its cinema industry, its music, its sense of freedom. But, behind this mask of freedom and innovation, it has a dark side. Pixelpancho thought he was facing an advanced country, the most advanced of the planet, but he discovered it has the same problems you can see everywhere. Under the face of the princess you can see the marijuana, which is now legal but so taxed that the black market has not stopped: it’s a non-sense. The non-sense of a glamour country, which hides its corruption. In “El Punto” Neighborhood in Salem, Massachussets, Punto Urban Art Museum features over 50 large scale murals by 18 world renowned and 20 local artists within a 3 block radius, aiming to create neighborhood pride and increase economic opportunity for local businesses. Pixelpancho Studio took part in this project and designed, on a huge wall, his famous Garden Boy. This Garden Boy is Pixel’s wish for everyone to approach a natural which is really natural. Because “natural” doesn’t mean a word written on the packaging of the food you buy at the supermarket: natural is a lifestyle, is your involvement in doing something useful for you and for the Earth. Becoming self-sufficient is our only anchor of salvation: we are always in search for perfection, for an immortality who cannot exist. And robots explains this desire. But we should focus on nature, because it’s stronger then us. And it’s the only thing that can save us. “La jeunesse de Tierry et Diana” is a tribute, a gift Pixelpancho wanted to give to a woman, Tierry. She lives next the wall he was painting, where she has a small parking lot. But, Tierry, is above all a farmer. Behind the parking, she has her hens and rabbits, and plants from which she derives herbs and vegetables. It’s like a secret world, that little farm. And it’s our idea of what everyone should do in his life. So, this is Pixel’s way to tell her “thank you”. And Diana? Diana is his beloved cat, who died while he was working. Regia: Peppe Melizzi | Pilota Drone Apr: Antonio Malvestuto | Montaggio: Martina Montemagno | Color Correction: Atelier010 | Produzione esecutiva: Manta Movie | Prodotto da: Comune di Montesilvano. 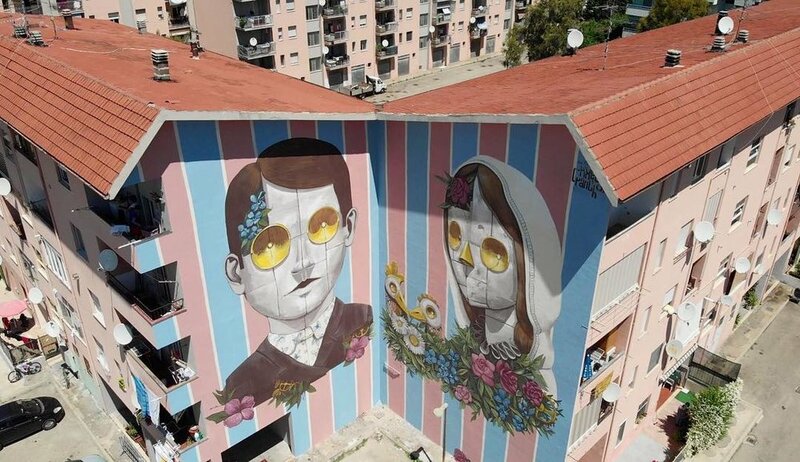 Pixelpancho painted this huge wall in via Rimini, a critical part of the Italian city of Montesilvano (Abruzzo). There, he saw people without opportunities, in the same situation that – we guess – we could find in every city of the world. Here, people are forced to criminalize their own life to survive. Pixel spent one week with them, he stayed in every home, he saw mothers and fathers fighting to make their sons and their daughters survive, to give them a better life. This wall, is the artist’s hope for them. It’s a wish: you can do it. If you stay united, if you rediscover the beauty of being a strong couple, you and your family can win over this life. During Houston Mural Festival, Texas, Pixelpancho painted a wall which is a tribute to his favourite animal: the cat. He painted two of his beloved cats, Blanco and Conan. He painted their love, and did it with the love he feels for them. 120 meters wide and 10 tall, the wall rapresents the continuation of love in the transition between life and death. HKwalls 2017 was only possible with the immense support of VANS Hong Kong, Eico Paint, Ovolo Southside, Montana Colors, Young Master Ales, Egg Shell Stickers, and Aveune des Arts. This wall is a representation of what Hong Kong is. Pixelpancho did it for HKWalls, and he would like to give an image of a city which is the real economic heart of China. "The only war that humanity can take care of, is the war against his own extinction" says the Chinese sign under the painting. A painting which represents the contradiction of this city: Hong Kong is full of parks, it has a wonderful nature, but men persist in massing themselves in very high and overcrowded buildings. They stopped to use their bicycles, they forgot the beauty of walking among the trees: and this removal from nature will lead us to extinction. 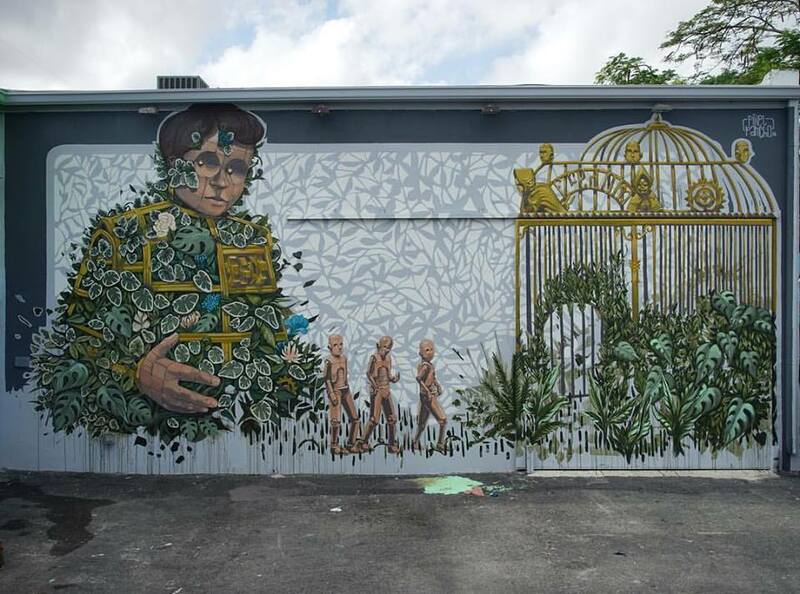 Our studio took part in Miami Art Basel, and Pixelpancho painted this wall in Wynwood Walls area. Wynwood is the artistic heart of Miami, and it’s a reference point for the whole United States. He gave his personal interpretation of a freedom which, actually, it’s not a freedom. Freedom, in our society, is a golden cage of taxes and rules, the same cage in which robots are entering, pulled by a huge man. They say we should have no fear, but we have to: we have to keep our eyes open, to be scared of this world. Fear is a possibility of salvation. During his journey to Cordoba, Pixelpancho painted this wall for an art gallery. Uruguay, Argentina's twin sister, had just legalized marijuana. This is his (funny) tribute to that decision. Bushwick, in Brooklyn, is a destination for legal murals. Here, artists from all over the world painted their walls. Pixelpancho has been there several times and, the last one, he painted one of his signature artworks, a lady robot wearing a dress made of blossoms and leaves. She looks back, over her shoulders. Maybe at her past, maybe at what we are doing to our world. Pixelpancho Studio has been invited to take part in Jidar Festival, an art festival in Rabat (Morocco). Here, in this city where history meets the future, the king wanted to bring artists from all over the world with their ideas, their vision of art and their multiculturalism. Pixelpancho paid tribute to what, in Morocco, is a traditional job: the sheep breeder. So he decided to paint, on the huge wall, a robot shepherd taking care of his robotic herd. The artwork, “Self efficient world”, reflects on the use of technology and its relationship with nature: if everyone did his part, we would not need money, banks or taxes. It’s an utopia, maybe. It’s difficult, but not impossible. During the FestiWall Street Art Festival in Ragusa (Sicily), Pixelpancho paid tribute to people who - in the past as nowadays - work as oranges pickers. This work has its roots in a distant past: at the end of the Nineteenth century, there was a huge social gradient between the Regno delle due Sicilie (Kingdom of the two Sicilies) and the rest of Italy. Orange, which is considered an Italian excellence, is also the symbol of the basification of society. The Borbones destroyed the cultivated fields and planted oranges throughout the Southern territory, in order to base the economy of the area. Years later, oranges become the symbol of the immigration, the only thing an immigrate has to support himself. Or, more often, to try it. Realized for Shine Fetuval in St. Petersburg (Florida), “Against Monsanto” is a large scale wall of 150 wide x 12 meters tall. It rapresents the money interests to the detriment of the environment and humanity. Memorie Urbane is a festival which is staged in the Italian city of Gaeta (Lazio). Its aim is to bring contemporary art practice and in particular urban art "in the open", as a frontier art, placing it in close contact with the territory in order to stimulate a process of interaction and mutual contamination. Pixelpancho painted this lady robot on the wall of what should have to become a prison for pregnant women and for woman with babies. A prison that, ready to be used, has never been opened. It’s a waste, as often in Italy happens, but above all is a wrongdoing. Because, the unequal treatment of men and women does not even spare prison.